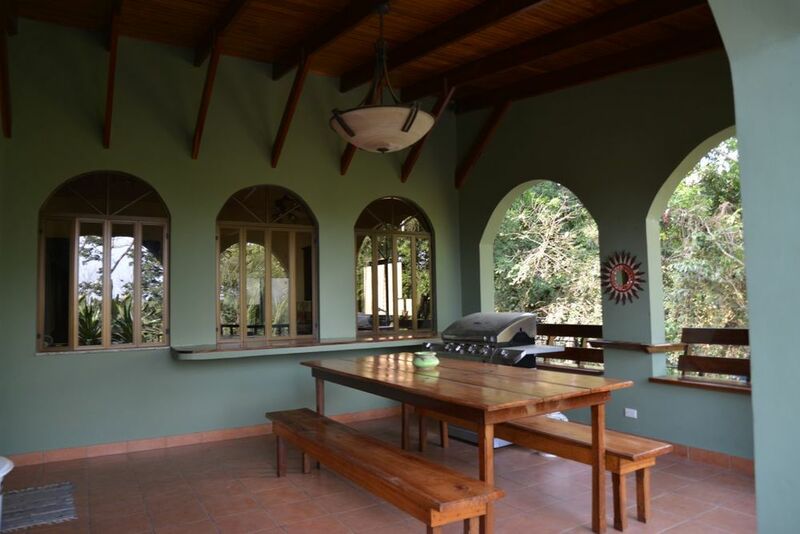 This is a truly incredible, one of a kind property located in the jungle off of Calle Hermosa. Featuring a high end main house, pool and spacious deck, as well as a guest house which could be used to generate additional rental income if desired. The entire property features large, mature trees, lush gardens with stone tiki art, hand laid stone work throughout the gardens and pool area, large wrought iron gate and fences along with a large brick driveway with plenty of space for parking. One of the many highlights of this property is the gorgeous, rustic patio which showcases a custom pool with seating and lounge space within the pool, a large seating area with rich, wooden deck, a tiki bar and outdoor shower. Balconies at various levels look out over the pool and lead to the second level patio which is an expansive space perfect for sun tanning and entertaining, with both covered and uncovered sections. The property also has a complete wrap around staircase from the pool area all the way to the back of the house as well as a spiral staircase leading to a covered observation deck. The house has an covered BBQ area, fantastic for entertaining. Features include custom wooded seating, stainless steel BBQ, views of the pool and lounge area, vaulted ceilings with wood features as well as a granite pass-through to the high-end kitchen and grand wooded doors that lead into the living room. The entire house showcases custom built concrete furniture, adding a modern touch, which allows for ease of decorating with cushions and throw pillows. The unique furniture includes seating in the living room and master bedroom as well as shelving and counter space. The main floor features a high end kitchen with granite counter tops, dark cabinetry, stainless steel appliances as well as a breakfast bar. 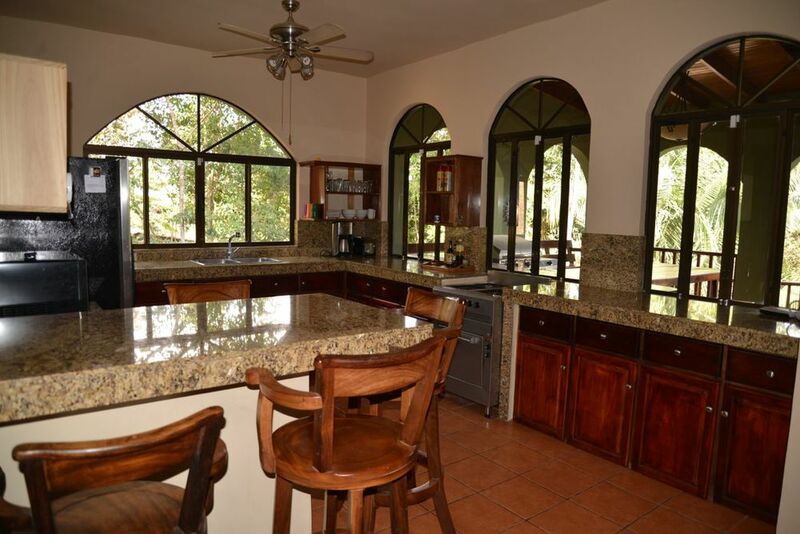 Next to the kitchen is an expansive living room with vaulted ceilings and great views of the pool and BBQ area. Make your way through the kitchen to the back of the house, which features a bright bodega, laundry room, second bathroom as well as 2 of the 4 bedrooms. The second floor includes an additional bedroom, the master suite with a great sitting area and large flat screen TV and master bath featuring a shower with jacuzzi tub and custom shelving. There is also access from the second floor to the observation deck just outside the master bedroom. 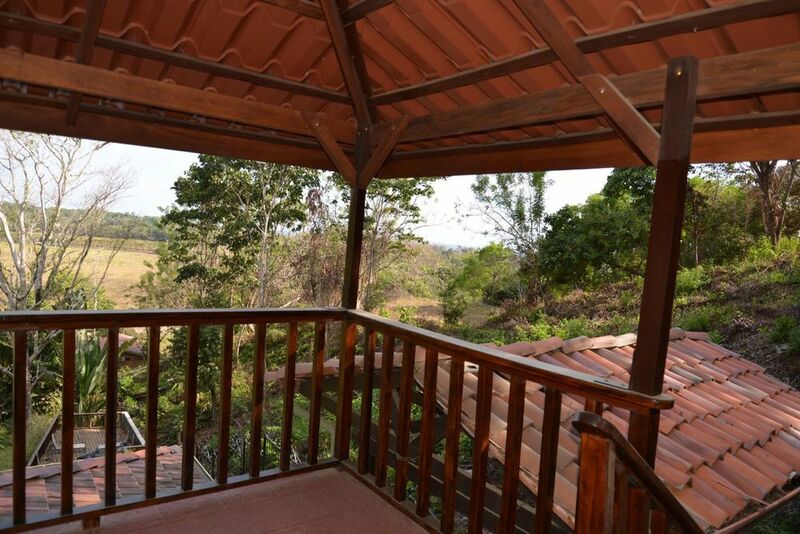 This is an incredible property which can be used as a vacation rental a private home, or a combination of both. 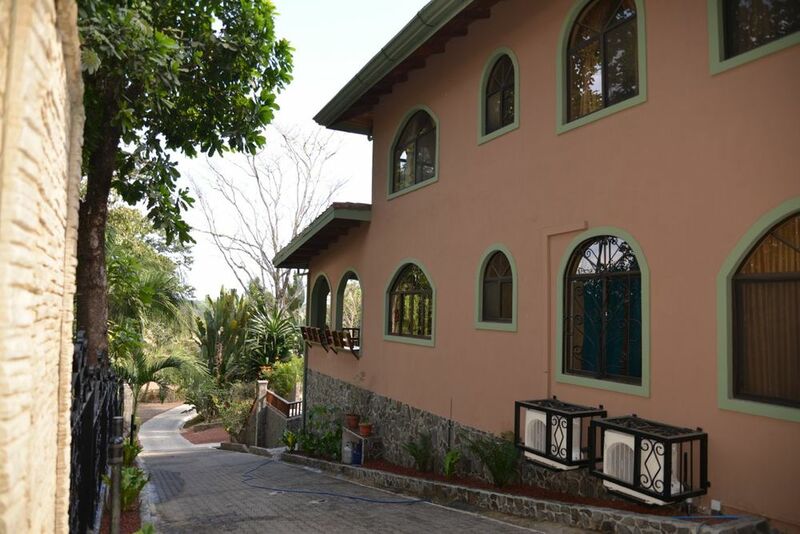 Pacific Properties presents a truly incredible one of a kind property located on Calle Hermosa featuring a high end main house as well as a guest house which could generate additional rental income or used as a home for a security guard. The entire property features large mature trees, lush gardens with stone tiki art, hand laid stone work amongst the gardens and pool area, large wrought iron gate and fences as well as a large brick drive way with plenty of space for parking. One of the many highlights of this property is the incredible pool & patio area which showcases the custom one of a kind tiled pool with a large sun lounge area, pool side tiki bar and pool side shower. The second level patio features a large area perfect for sun tanning or additional patio seating. The property also has a complete wrap around staircase from the pool area all the way to the back of the house as well as a spiral staircase leading to an observation deck. The house has an incredible covered BBQ area with custom wood seating, a stainless steel BBQ, views of the pool & lounge area, vaulted ceilings with wood features as well as a granite pass through to the high end kitchen and wood doors to the living room. The entire house features custom concrete details including seating in the living room and master bedroom as well as concrete shelves and bunk bed, creating spacious sitting arrangements and easy decorating with cushions and throw pillows. The main floor features a large high end kitchen with plenty of granite counter tops, dark cabinetry, stainless steel appliances as well as a breakfast bar. 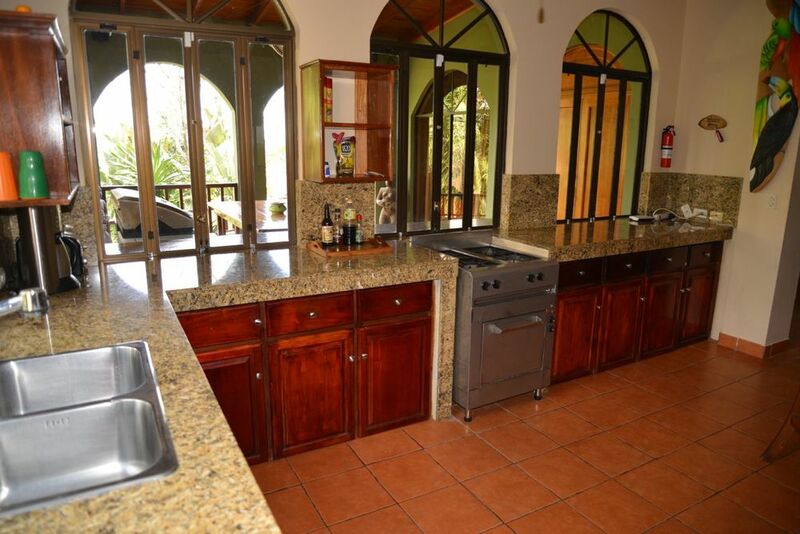 Beside the kitchen there is a large living room with vaulted ceilings and great views of the pool and BBQ area. Make your way through the kitchen, to the back of the house which features a bright bodega, laundry room, second bathroom as well as 2 of the 4 bedrooms. The second floor includes an another bedroom, the master bedroom with a great sitting area and large flat screen TV & master bath featuring a Jacuzzi tub, custom shelves, large tub & shower. There is also access from the second floor to the observation deck just outside of the master bedroom. 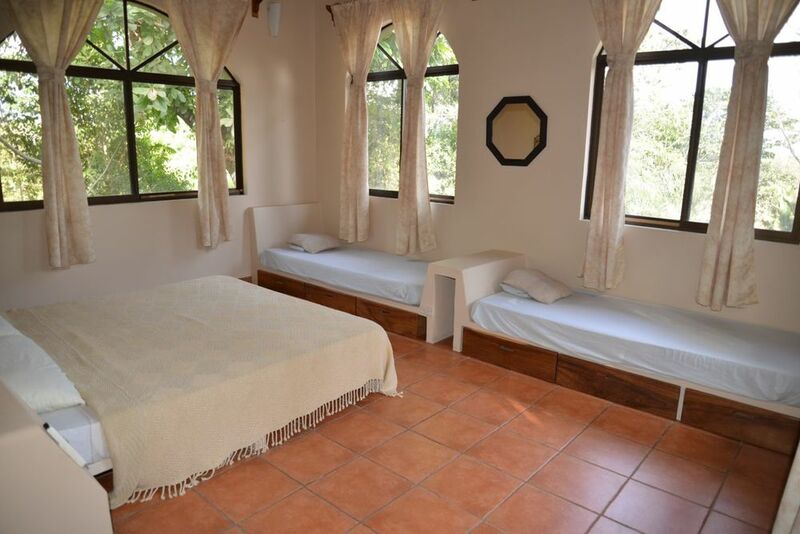 This is an incredible property which can be used as a vacation rental a private home or a combination of both.